Group size: maximum 8 motorcycles, 2 – 14 people (8 riders & pillions). 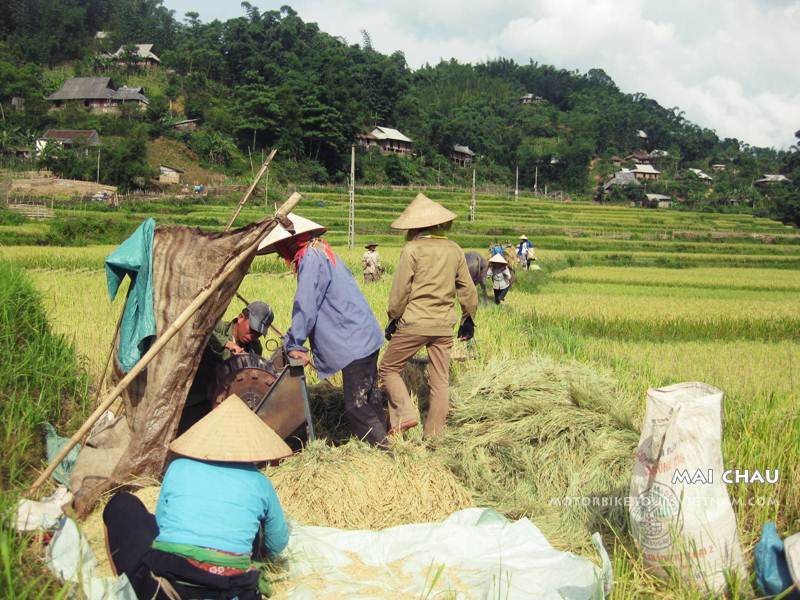 This is a special itinerary with the experience on various topographies and exciting activities, also suitable with travellers with limited time yet still love to have a panorama on Vietnam expanding from North to its Centre. With in-depth knowledge of geography and landscapes, our guide will take you to discover a part of Ho Chi Minh trail as the starting point of the lorry trips of goods, weapons and food southward the country to serve for the Vietnam War. On passing Centre area, you will have chance to explore the largest cave in Vietnam, coastal tunnel Vinh Moc and isolated beaches. Apart from these, you will visit two major heritage sites of Vietnam such as Hue and Hoi An, where mark the Vietnamese feudal architecture and culture. The Ho Chi Minh Trail was not just one trail but a series of trails which was used by the North Vietnamese as a route for its troops to get into the South. They also used the trail as a supply route – for weapons, food and equipment. The Ho Chin Minh Trail ran along the Laos/Cambodia and Vietnam borders and was dominated by jungles. In total the ‘trail’ was about 1,000 kilometres in length and consisted of many parts. On this trip you will get to discover some parts of it but not all. 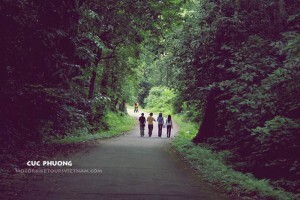 After leaving Hanoi, ride along the legendary highway no. 6 to reach Mai Chau. Find out about the Thai’s culture and Northwestern Vietnam’s character. Stay overnight in Mai Chau at a local family house, enjoy some ethnic food and explore their daily lives. Leave Mai Chau to start the very first part of the Ho Chi Minh trail, into the mountain villages and Cuc Phuong National Park. Here you will be impressed by a picturesque waterfall deep in the mountain. Feel free to swim, relax and enjoy some drinks right beside the fall. Dinner will be more interesting with some snake wine, a local specialty made with wild cobra. 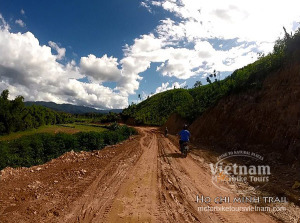 Continue your journey on the Ho Chi Minh trail. On the way from Cuc Phuong to Yen Cat, you will pass by the Muong village, a minority group living dottedly from the centre north to centre south. Stop by an ancient citadel under the Le dynasty to discover the relics of the old palaces and temples. If coming here during spring, you will have chance to join unique festivals. On arriving in Yen Cat, riding through the narrow paths of Ben En National Park, a highlight part of any motorbike tour. Overnight in Yen Cat. 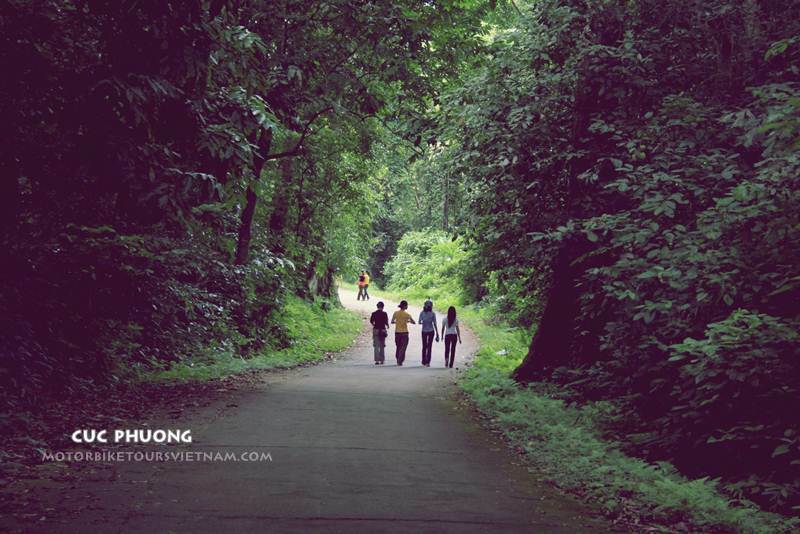 If arriving in the Ho Chi Minh trail, you will pass through the old forests along Truong Son mountain range, which are specially tropical with bamboo forests. Our guide will show you some war relics with several tanks and airplane pieces lying on the way. You will also visit isolated minority groups with rarely connection to the outside world. It was not until the 1986 supporting policy of the government that they were moved to a new area with better facilities. One of the highlights of the trip is the Phong Nha – Ke Bang National Park with a largest system of caves and grottos in Vietnam, and maybe over the world. 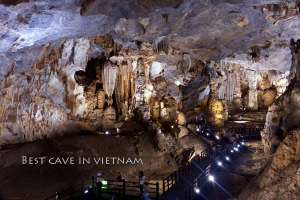 Do google the word “Son Doong” and you will find out about this.Arrive in Phong Nha, you will have 1 day to explore the caves and enjoy the stalactites and stalagmites which were formed million years ago. Option 1: in the morning, take a cruise to discover Phong Nha Cave along the underground river inside. 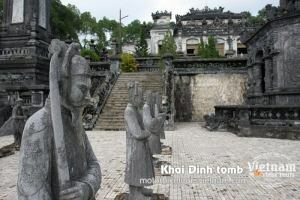 In the afternoon, our guide will bring you to visit the tunnel system of Vinh Moc. Stay overnight by the quiet beach after enjoying the local seafood specialties.Option 2: Spend the whole day to explore Phong Nha cave, stay overnight in Phong Nha. 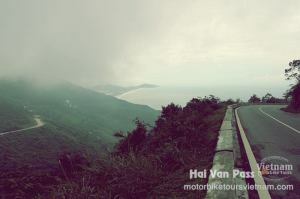 Follow the Option 1: After a nice evening by the beach, we will ride you along the coastal line to Hue. Of course we cannot miss the picturesque fishing villages on the way. Stop over to find out about their daily lives. Follow the Option 2: Continue to experience the Ho Chi Minh trail, ride along the Vietnam – Laos border to reach Khe Sanh, a famous place in Vietnam war, where many fierce battles between Northern Vietnam troops and American military. Khe Sanh is also known as the 2nd Dien Bien Phu in Vietnam. With this option, you will have chance to understand more about Vietnam war. After this, head to Hue for an overnight stay. Hue is known as an ancient capital of Vietnam during the 19th century as well as of the last feudal dynasty of the country. On visiting Hue, you will be enchanted with a country historical period full of ups-and-downs through its antique architecture. Go for a walk around the ancient citadel or through the mossy streets. Discover the King’s tombs with various architectures and enjoy the food specialties of Hue royal cuisine. In the evening, join a cruise along the romantic Perfume river while enjoying Hue royal folk songs. This will surely leave an unforgettable moment to your journey. Ride your motorbike along the beaches, take photos at the scenic wild beach of Lang Co with endless waves. 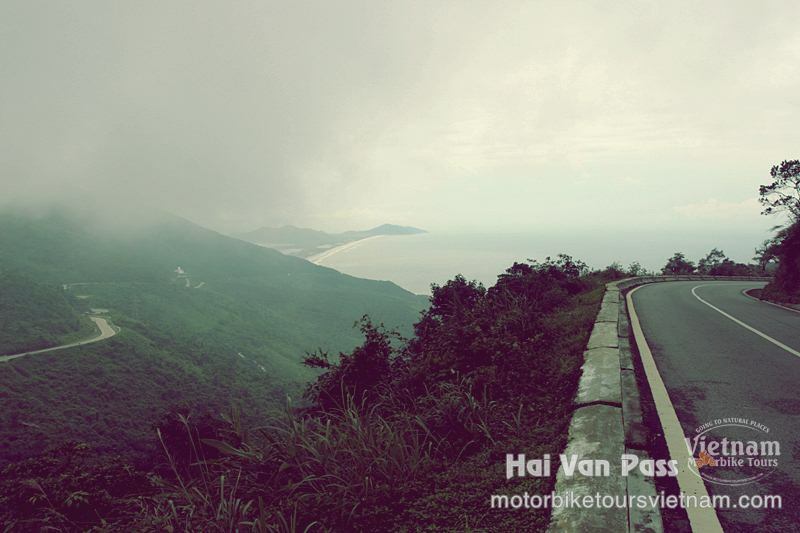 On the way to Danang, stop over at the breathtakingHai Van Pass which might not be seen anywhere else in the world. Arriving in Hoi An in late afternoon, take a rest before attending numerous exciting activities at some night bars. 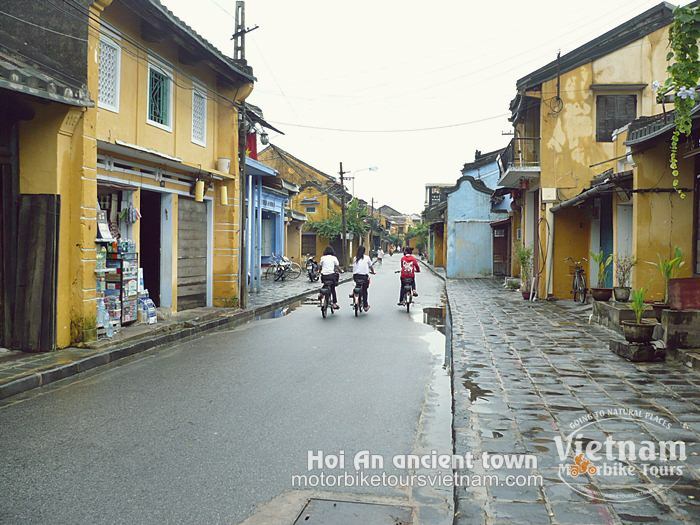 Don’t forget to walk through Hoi An ancient town with colorful lanterns. Hoi An is especially attractive during full moon night, when the ancient houses are decorated with sparkling lanterns. In the morning, go for a walk on the old streets, enjoy traditional foods of the local people and find out about their culture. Hi, we are looking to do this trip in November 2015 with 4 people all riding motorbikes. How much will this cost trip? Hi fraser, the motorbike trip price depend on the number of riders and kind of motorbike. I will send you an email with detail prices. Thank you so much, hope to see you in vietnam.